DOUBLE LOOP Sugar - 3.75 in. tall x 4.25 in . top diam.- Marigold. DOUBLE LOOP: This Northwood set is found most often in cobalt blue and aqua opalescent, with marigold, amethyst and green seen somewhat less often. 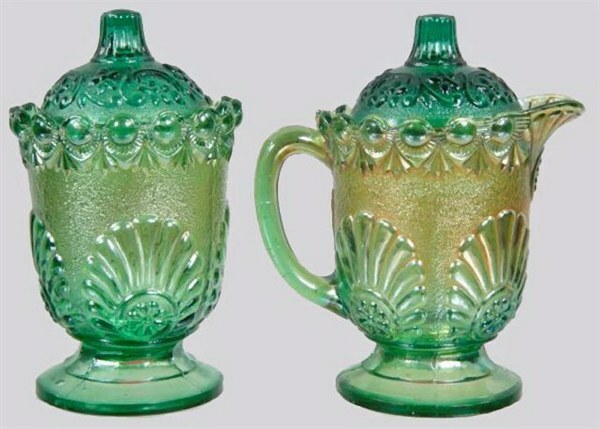 The scalloped foot on the open sugar places the design in a category by itself, but the overall appearance of that and the creamer are not among the most significant of patterns. 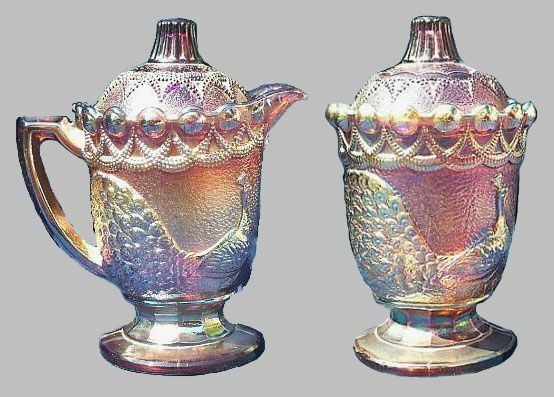 Iridescence is usually quite adequate, but generally speaking, this set is not popular with collectors, keeping prices rather low. Sugar - 2.75 in. tall x 5.50 in. across - Green. LUSTRE FLUTE: Was among early carnival production, dating to 1909. 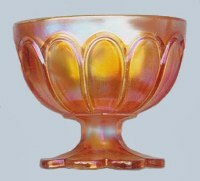 The design was a carry-over from earlier Northwood opalescent and crystal ware. 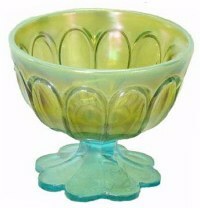 Green examples are usually endowed with the Alaskan iridescent treatment. 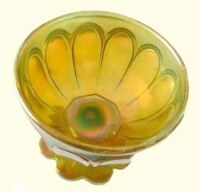 Marigold pieces are bright and colorful, but certainly not plentiful. Amethyst examples are quite difficult to locate. The simple pattern does not provide great collector interest, so prices can be quite reasonable. ORANGE TREE Set in RARE White. -- Courtesy Jim Seeck. ORANGE TREE: The Fenton Orange Tree pattern is presented to collectors in many forms and shapes, but in this breakfast set, abundance is not a mode for consideration! Aqua Opal and white sets are quite scarce, with marigold, amethyst and blue sets very little more available. Production may not have been profuse as with bowls, but use and breakage no doubt took a toll. SHELL and JEWELS - Westmoreland -Lids seem never to be iridized. SHELL & JEWELS: These pieces are from an early Westmoreland line known as Victor. Only this breakfast set has been found iridized. Notice however, that lids on the old sets are not iridized. Green, marigold and amethyst are the known colors. 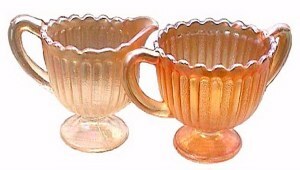 Marigold STIPPLED RAYS by Fenton. 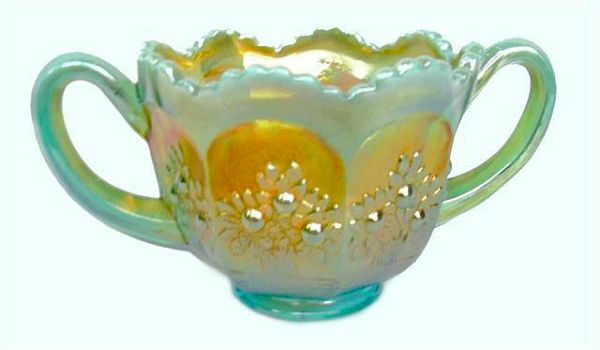 STIPPLED RAYS: Marigold sets are seen on occasion, but this Fenton pattern presents itself more often in either an open sugar in blue, red, or vaseline, with alternatives in creamer form; with green and vaseline as known colors. It could require some serious time to accumulate complete sets in each of the colors, if such is at all possible. STRUTTING PEACOCK: Westmoreland produced this set in amethyst, then reproduced it in the 1970s. 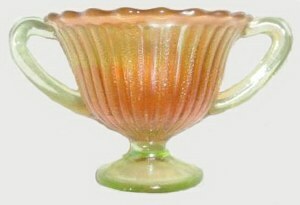 There is a known green set or two, but no other shapes are known in the pattern, excepting a small rose bowl made from the sugar base-for Levay. Beware that eBay sellers might claim these to be vintage-(old). Blessed are You O Lord! Teach me Your statutes. I will delight myself in Your statues; I will not forget Your Word. Psalm 119 is the longest psalm, with 176 verses. It is a personal prayer for help. God is mentioned in every verse of this psalm. and is referenced to as: The law of the Lord.